The city of angels has opened its arms to a whole new level of shelters, by opening up a 224-bed homeless facility. The cities efforts come after a legal dispute with homeless advocates in hopes this will bring peace to their city’s streets. Salvation Army has put together a two acre-site, located at 1455 South Salvation Place, features an open-air campus with ten rooms, a dining hall, office spaces, a laundry room, equipped with fully stalked bathrooms and showers, a dog run, and an outdoor park. The shelter only houses adults, however, will allow children in emergency situations Salvation Army Busses provide the transportation that will be free for use to all residents that are accepted. The layout of the shelter comes with privacy in mind, allowing separate dormitories for women and men, although the shelter does provide a corridor for couples. The $13.1 million design includes 20 beds in each area and barriers separating the sleeping areas. Many of the staff includes case managers, clinicians, counselors, house navigators and security officers that are trained in how to deal with the homeless and their mental and physical issues. The new facility took only nine weeks to build, which includes free water-bottle filling and solar-charging stations for phones and electronics. Just a few blocks over another Anaheim shelter with 101 bed that is expected to open this month located at 3035 La Mesa St. According to the city’s legal settlement, the shelters are part of the requirements that mandate the city to provide 325 beds by early 2019. The initial agreement was reached in November which was launched by a lawsuit brought to the town by homeless advocates against several cities after the quick removal of the tent city near the Angel Stadium that seemed to go up overnight. An emergency shelter opened up Dec.20, was placed to serve as a temporary band-aid during the winter months while the other two were in the process of construction. The building is still open and will remain open for the next 90 days, with the possible extension for one-month. 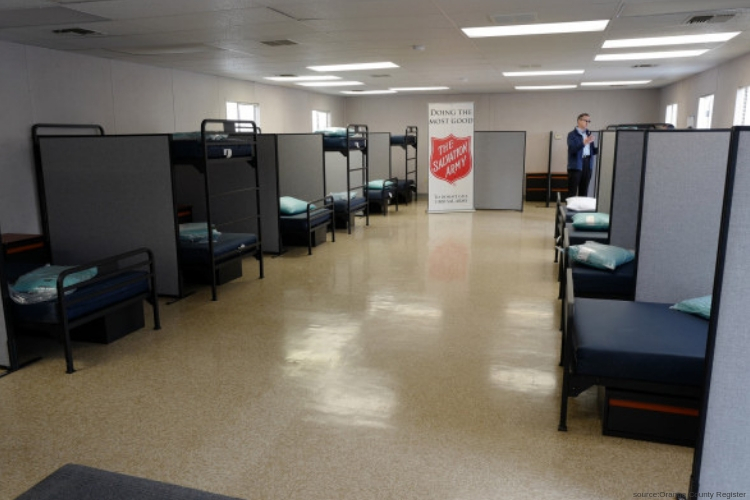 Mike Lyster, an Anaheim city spokesman, announced that the opening of the new shelters couldn’t come soon enough, the emergency shelter is almost near its capacity of 200. To receive a bed at one of the new salvation army locations, residents will be referred primarily through City Net, a non-profit that recently led the country biennial homeless count. The number from the countywide county are expected to be released in April. The Salvation agency will soon become part of the organization’s Center of Hope, which plans on building a 155,000-square-foot homeless care center expected to open in early 2021. It will most likely cost the city of Anaheim $60-million and have over 600 beds. The build-out is said to begin once the results and reviews come back from the newly opened shelters.